It’s nearly Easter egg time but, with a wide range of dark, complex bars of chocolate now available, why limit yourself to its sweet side? A few years ago I spoke to chocolatier Willie Harcourt-Cooze about his mission to introduce 100% cacao bars as a new gourmet cooking ingredient, prove that chocolate is not just for pudding, and his Irish roots. “I dreamt of making the finest chocolate in the world!” The charismatic Willie Harcourt-Cooze is in full flow, describing how he started on the journey that had him arrive on our television screens in 2008 as the star of Channel 4’s fly-on-the-wall documentary, Willie’s Wonky Chocolate Factory. He was a romantic hero, an ever-so-slightly demented man with a mission, in his efforts to bring the cacao beans that he grows on his Venezuelan plantation to market in the form of intense 100% cacao bars – and to educate people on the wider uses of this kind of chocolate. Harcourt-Cooze almost burst out of the small screen. With his crazy ideas, big plans and boundless enthusiasm it was impossible not to get swept up in his passion as we watched, fascinated, to see if he had the practical skills to turn those dreams into reality. That project was a success. 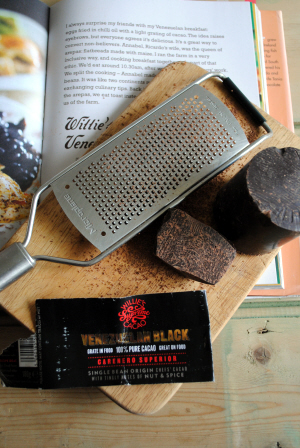 With enough will-he, won’t-he tension to keep people hooked, Harcourt-Cooze produced the bars (by the skin of his teeth), got them into shops, had people asking for cacao instead of chocolate, and started a whole new craze for using it in savoury dishes. While milling flour, growing vegetables and foraging as a child, Harcourt-Cooze learned the value of good quality ingredients. 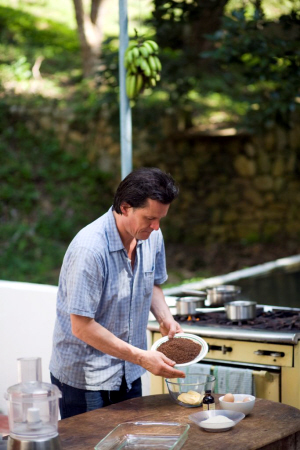 Years later, after he and his wife Tania bought a remote hacienda in Venezuela and started growing their own cacao, it made sense to him to see the product through from exceptional bean to first class bar. When the couple and their three children settled back in England he set about building his own chocolate factory in Devon but it wasn’t until the television series started filming that he really hit high gear. The sweet bars are intensely covetable little objects. Exquisitely packaged in a neat, dark brown box which contains two squares, their various fruity, caramel, and nutty notes are like the gateway drug, the introduction to a new world of chocolate. Having tasted these, it is just a small step to start experimenting with 100% cacao. Willie’s World Class Cacao bars are available from Brown Thomas, Avoca, Harvey Nichols, Fallon & Byrne, Listons, Cavistons Food Emporium (Dublin), The Chocolate Shop (Cork) and online at www.williescacao.com. Willie’s Chocolate Factory Cookbook and Willie’s Chocolate Bible are published by Hodder and Stoughton. This is good enough on its own for a simple lunch but is also gorgeous served over brown rice, polenta, Fennel-Aniseed-Caraway Bread, fried potatoes or Mexican Beans. Heat chilli oil in a small frying pan – not too much, beware of choking chilli fumes! – and fry egg. Meanwhile, toast and butter the bread, slice the avocado. Serve the egg on top of the buttered toast with the avocado on the side and plenty of grated cacao on top. Devour!